Louise Hay passed on today peacefully in her sleep. She was an inspiring author and the founder of an incredible publishing company called Hay House that produces content in the spiritual and consciousness realm that has shifted the lives of many. Hay House released a statement following her passing earlier today. 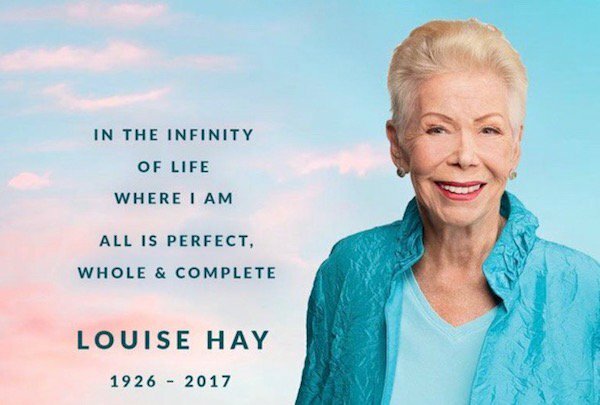 Our beloved friend and founder Louise Hay transitioned this morning, August 30, 2017, of natural causes at age 90. She passed peacefully surrounded by loved ones. Louise was an incredible visionary and advocate. Everyone who had the privilege to meet her, either in person, or through her words, felt her passion for serving others. We decided to pull together 20 quotes that helped best describe the type of work Louise brought to the world. Her work has inspired our here at Collective Evolution in a number of ways. Thanks Louise for your dedication to this mission we are all on to create a shift within ourselves to create a shift in the world.